1889 engraving of the California Hotel, where Parker plied his trade as a barber. The building was lost a few months later in Spokane’s Great Fire, but the Parker family endured. Image from Spokane Falls Illustrated (1889). Sometime before 1885, J. Bryson Parker, a barber by trade, moved from Nevada to set up shop in the booming frontier community of Spokane Falls in the Washington Territory. Parker was African American, listed in the 1885 census as “mulatto,” a term which in those days meant someone whose ancestors were both black and white. 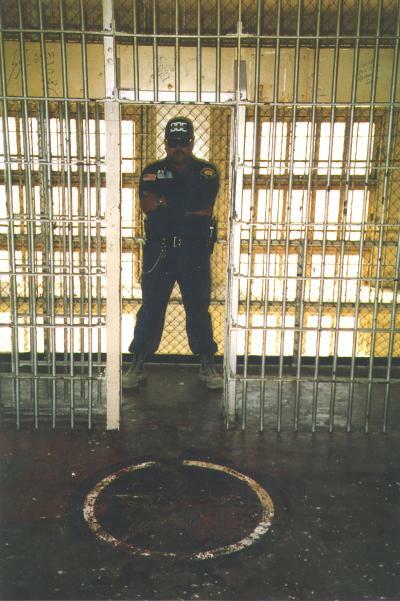 Guard in front of painted pentagram, 1985-2008, Department of Corrections, McNeil Island Corrections Center Photograph Collection, 1855-2010, Digital Archives, https://www.digitalarchives.wa.gov/. In 1971 Charles Manson was convicted of murder and conspiracy to commit murder of seven people that were part of a cult he led in southern California. It was a gruesome crime that garnered national attention but it was not Manson’s first contact with the courts. Japanese Americans evacuating from their homes in Bainbridge Island, 1942. Image courtesy of the Museum of History and Industry. On December 7, 1941 Japanese aircraft executed a surprise attack on Pearl Harbor, a U.S. naval base in Hawaii. Just three months later, in March 1942, President Franklin Roosevelt signed Executive Order 9102, which established the War Relocation Authority. The agency was tasked with removing and interning Japanese Americans in the coastal areas of the West Coast, where they were perceived by the government to be the greatest threat for acts of espionage. One of the first removals occurred in the Bainbridge Island area, just outside of Seattle. Histogram of the Chelan County Auditor, Miscellaneous Recordings illustrates the rapid increase in this record series since 1974, and also a gap in the records in 2009, Washington State Archives, Digital Archives, https://www.digitalarchives.wa.gov/. By the time government records get to the Washington State Archives, they are not always complete. Months or years of a given records series may have disappeared in a flood or fire or simply have been disposed of by the originating agency. These gaps in a record series can frustrate researchers, who logically assume that if we have the records for 1960 and 1962 that was also have them for 1961--which is not always the case. Image Courtesy of the Associated Press, San Bernardino County Sun, February 14, 1979. On Monday August 21st, 2017 the moon will pass between the sun and the earth casting a wide shadow over parts of the contiguous United States for the first time in nearly four decades. Skywatchers and armchair astronomers in the Pacific Northwest and beyond will flock to central Oregon in hopes that Mother Nature will offer a clear sky to enjoy the once-in-a-lifetime astronomical event. Although Denny Hall has undergone major renovations as recently as 2015, the exterior remains virtually unchanged to this day, Washington State Archives, Digital Archives, https://www.digitalarchives.wa.gov/. Built in 1895, Denny Hall is the oldest building of the University of Washington. It was designed by Charles Saunders in the style of the French Renaissance Revival and built with brick and sandstone. The University prioritized the building in their "Restore the Core" initiative, which aimed to restore fifteen historic buildings on the campus. 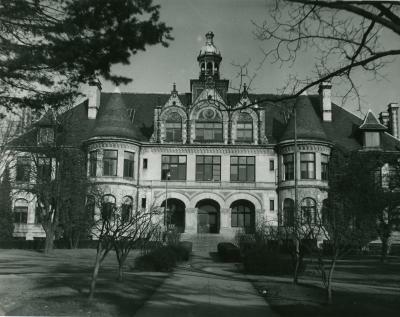 Spokane County Courthouse, 1895-1905, General Subjects Photograph Collection, 1845-2005, Washington State Archives, Digital Archives, https://www.digitalarchives.wa.gov/. The Great Depressions eliminated jobs across the country in every field from coal mining to journalism, leaving a quarter of the workforce unemployed. In an effort to rebuild the economy, President Franklin Roosevelt created the Works Progress Administration, a part of the New Deal, to put folks back to work. One WPA initiative was the Federal Writers Project, which employed researchers and writers to collect oral histories, write travel guides, and inventory archival repositories. Marie Jeanette DePape’s cause of death is listed as “wounds (by murder).” Her death set off a scandal that rocked Spokane in 1898. Washington State Archives, Digital Archives, Spokane County Auditor, Death Returns, 1888-1907, Marie - Depape - J. In 2015, Archivist Allie Honican received what seemed an ordinary reference request. A researcher in France wanted more information about his great-great aunt. All the man knew was that the woman had died in Spokane in 1898, could Honican tell him anything more? Treasures of the Archives: How Do You Like Them Apples? Climb a tree in heels? Washington State Archives, Digital Archives, http://www.digitalarchives.wa.gov. Senator Barbara Granlund, photographed here in 1979, is one of the interviewees in this collection. Photograph courtesy of the Washington State Legislature. Women in the Washington State Legislature, Oral History Project, 1980-1983 is one of the valuable oral history collections here at the Digital Archives. 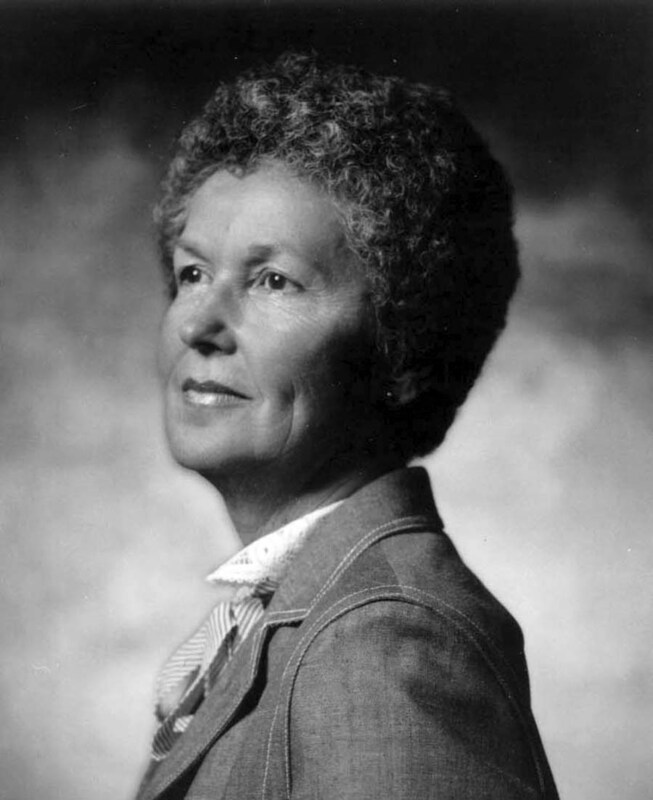 Between 1980 and 1983, oral historian Kathryn Hinsch conducted 38 interviews with female members of the state legislature. Spokane pioneer and educator Edith Boyd, Washington State Archives, Digital Archives, http://www.digitalarchives.wa.gov. Edith Boyd (1874-1972) came to Spokane in 1894. In this 1970 interview (completed when Boyd was 96 years old), she recalls many colorful stories about the presence of Native Americans on the streets of Spokane in the 1890s and 1900s, when “blanket-draped figures walked the town streets”. Her memories are evocative and very specific, including the location of Indian camps, and the work Indians performed in town. Have a listen.